4 Bedroom, Sleeps 12, Fully Equipped, Family Friendly, with Amazing Views. Wisteria Cottage in Janaillat, is a beautiful rural family holiday cottage that has been beautifully modernised & renovated to keep all its charming original features whilst adding modern touches to provide a relaxing, enjoyable and comfortable family holiday. The cottage comprises on the ground floor of a large open plan fully equipped kitchen / lounge area with original fireplace and log burner (31m²) and a separate dining room to seat 12 (23m²), on the first floor there are 2 large double bedrooms (15 & 18m²), a full family bathroom and a shower room, and on the second floor there are 2 Twin/Family Rooms (both with 2 Single beds and a Double Sofabed - (26 & 34m²)), so the cottage can comfortably sleep up to 12 people. We can also provide a cot & highchair. If you are looking for a "Home from Home" holiday cottage, where you can get together with all the family or a group of friends then this is just the place. Set in a perfect location to admire the rural scenery, enjoy the quiet and take leisurely walks. This cottage is one of two but each cottage is entirely private & self-contained, having its own entrance, patio terrace area with patio furniture and BBQ for alfresco dining. The two cottages share the heated in-ground pool and garden area, we have found after running the business for 8 years now that this works extremely well as the children from the two cottages make friends and entertain themselves allowing the parents time to relax and unwind, taking time out to read their book or listen to their music without interruption. There is large private garden that is completely secure for little ones with loads of room for them to run around and have loads of fun with lots of outdoor toys. The location of the cottage is ideal for a relaxing family holiday, and it’s only a short drive to the supermarkets, cafes and restaurants. The local boulangerie in Saint Dizier Leyrenne is a short 5 minute drive away for the daily croissant run. We have plenty of brochures & leaflets in the cottage to inform you about the many attractions in the area, and we are always around for you to ask us our recommendations or directions. The lakes offer lovely safe beaches and watersports, and there are many picturesque towns & villages with an abundance of history. So whether you want to be relaxing by pool or something more energetic Meadow View Gites can offer it all and is the perfect place for your holiday. The sun drenched heated pool is cleaned on a daily basis and the pool terrace area is equipped with relaxing sun loungers, settees, chairs and tables. We do also have sun parasols to screen those with sensitive delicate skin. There are wonderful views from the terrace and garden and we can let you know about the many walks or cycle rides along the country lanes and through woodlands. There is a stream just down the lane from the cottage where you can play “pooh sticks” from the bridge or try a spot of fishing. Wi-fi is free to use and the connection is available throughout the cottage. UK Freeview TV and French TNT TV is available in the cottage and there is a DVD player & I dock. We were both born and raised in Sheffield, England. Then in 2009 we have the idea about moving to France, firstly to have a more relaxed, stress-free life but also to give our children an amazing opportunity to learn another language and have the freedom to play-out without a care in the world! We found this property on the internet, and finally moved over to France in January 2010. We spent the last 3 years renovating a barn that we all live in and two gites. It has been a long, tiring battle, but now we have finished we can look back and appreciate that the job has been well worth it!We have therefore endeavoured to provide all amenities required to have a pleasurable and enjoyable holiday. We are an English speaking British couple with our two children, who own and run the site, we are always on site to offer help and advice, and we hope to promote a comfortable and relaxed atmosphere. We just love the peace and tranquillity of Janaillat, the weather throughout the seasons and trying out our French on the locals. There is nothing better than enjoying a freshly baked baguette, some local cheese and large glass of red! The area is so peaceful and safe, so they have the freedom to roam on their bikes and play out in the village, without us having to keep a watchful eye on them. There is no air or light pollution in this area, so the quality of the air we breath is extremely good, and the night skies are amazing with an abundance of stars! When we decided to embark on this project we did so with the principle that we wouldn’t expect anyone to stay in our accommodation unless we were completely happy to do so ourselves. Being set of the edge of the rural village of Janaillat, with have the added benefit of the outstanding views over the rolling lush green hillsides, which can be enjoyed whilst relaxing on our sun loungers around the pool terrace. We have transformed this derelict barn and cottage into a wonderful home and holiday rental cottage. Bath and hand Towels are included in the rental price, but please bring your own beach towels for using around the pool or for visiting the leisure lakes. Pool / Beach Towels can be hired. The white bath towels provided are not to be used around the pool or taken to the lakes. The cottage is in the quiet rural village of Janaillat, yet only a short drive to the local towns for shops & restaurants. Electric Heaters are available for every room. All bed linens are included in the rental, including cot bed. In the kitchen of the cottage. Wi-fi Internet access is available throughout the property (please ask on arrival for access code). We provide all bath & kitchen towels. We only ask that you bring beach towels for use around the pool or for taking to the lakes. We do have beach towels for hire, please ask for more details. Rustic Log Burner and Original Fireplace. There are 2 under-counter fridges, one for chilled foods and one for cooling beer & wine. Each fridge has a freezer compartment. We do provide a welcome pack on arrival (for bookings of 5 nights or more) and this includes the basics such as Tea, Coffee, Sugar, Milk, Salt & Pepper and cleaning cloths. 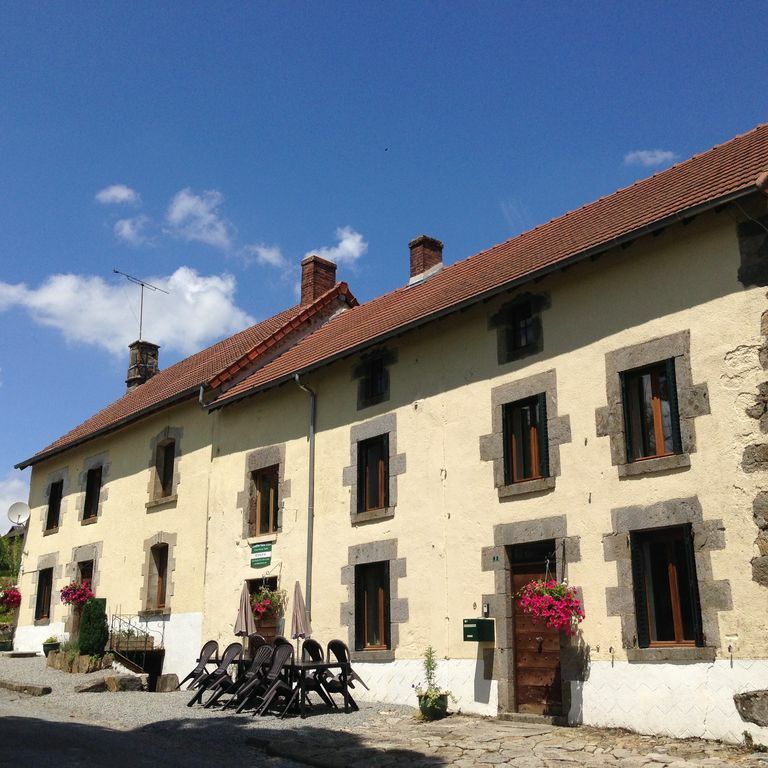 The gite is equipped to cater for 12 people. We provide plates, dishes, glasses, cups & cutlery. We also have all preparation and cooking utensils and pans, as well serving crockery. In the dining room, there is a large dining table to seat 8, there is also a small dining table in the kitchen area that can be moved to allow seating for 12. Plus a highchair on request. We provide a I dock. We have a variety of indoor & outdoor toys. Large safe & secure garden, with plenty of space for the children & adults to play. Various items of play equipment are available to use. These can be hired from Bike Hire Direct at a local charge. There is a communal tennis court at Saint Dizier Leyrenne, about 5km away. Our In-ground heated pool is fully compliant with French Pool Law. The pool is open from mid May to October (weather depending). The average temperature is 27⁰C and is cleaned on a daily basis. Our heated pool is private to the gite complex, but is shared with all gite guests. It's is cleaned on a daily basis, and is open from mid May-Oct (weather depending). Nous avons passé un agréable week-end, le gîte est très spacieux, très propre et parfaitement équipé pour notre groupe de 12 personnes. Les hôtes étaient très sympathiques. Les routes autour du gîte étaient parfaites pour les cyclistes ou les randonneurs. Le gîte est très bien équipé et situé dans un village rural calme, la piscine est chauffée et parfaite avec des vues exceptionnelles. Les hôtes Bryan et Jane étaient très agréables et serviables. Nous avons tous passé de merveilleuses vacances. We have just returned from a week’s stay in Wisteria Cottage and from the moment we arrived we loved it, the accommodation is perfect. Rooms are all beautifully decorated and a really great size, all the beds all very comfortable. Most of all everything is provided & the whole house was spotlessly clean. The facilities throughout are fantastic, ever detail has been thought of, in fact there was nothing else we could have wished for. Another special mention must be made of the pool, it is “Absolutely fantastic”, the host Bryan admits he has OCD with the pool, and he looks after it meticulously and whole terrace is spotlessly clean. We had several days just lazing around admiring the stunting views from the terrace whilst the little kids had hours and hours of fun in the pool. The location is on the edge of a small village, so is super peaceful and quiet. At night the sky is amazing and you can see so many stars even the milky way. Although secluded it's close enough to plenty of attractions if you fancy a trip out. The lake at Vassiviere is definitely worth a visit as well the village of Crozant. The hosts Jane and Bryan, and their two boys were just perfect, we thoroughly enjoyed their company, sharing many a drink with them. I must mention that they only joined us when we asked and otherwise left us alone. Nothing is too much trouble for them and clearly there only aim is to make sure we had a fantastic time, which we did. This was holiday to remember for all the right reasons and a new family that I'm sure we'll remain friends with for a long time. Magnifique emplacement, gîte très bien équipé, idéal pour se détendre et passer du temps avec la famille. From the moment we arrived at Meadow View Gite, we knew we were going to have a fabulous holiday. We have been holidaying in France for many years now and this gite is certainly one of the best we have stayed in. The gite was very spacious and immaculately clean, the beds were comfy, there’s a well equipped kitchen and amazing views. The location of the gite was very good as all the little towns and villages were only a short drive away, and the heated pool was lovely to relax in on hot sunny days. Our main purpose for this years holiday was to relax and we were certainly able to achieve this here. The rural setting is so peaceful and tranquil. The owners Jane and Bryan and their two boys Alex & James were lovely and very helpful. Especially James who had so much patience playing with our daughter on the swings and in the sand pit, this is definitely his forte for a career when he’s older. We really enjoyed our 2 week stay in the gite, so thank you so much for a lovely holiday, we will see you again in the future. Lac de Vassiviere - for Watersports, Beaches and Cafes. Labyrinthe Geant De Gueret - Huge Maze and Traditional Games. Les Loups de Chabrieres - Wolf Park in Gueret. Lac Courtille, Gueret - Great beach & watersports. The house is cleaned & prepared before each occupancy, and this is included in the rental price. Also all bed linen, bath and kitchen towels are included in the rental price. We do ask that you bring beach towels for use around the pool or if you go out to visit the lakes, or you can hire Beach Towels from us. We do ask that you leave the house clean & tidy, with everything as you found it. Also we ask that you leave promptly to allow access for cleaning/changeover. If the weather is cold a daily allowance of logs will be provided, additional firewood can be provided at a supplement. Electric heaters can also be provided. Please can you download our Terms & Conditions and return to us a signed copy.